RAF Scorton was opened in October 1939 as part of 13 Group Fighter Command and a satellite station of RAF Catterick. 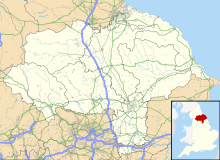 It was located near the village of Scorton in North Yorkshire, England. It was used by the Royal Air Force, the Royal Canadian Air Force, and the United States Army Air Forces Ninth Air Force during the war. The location was chosen for its flat terrain and its situation close to the now disbanded Eryholme-Richmond branch line that had a sub branch line to Catterick Garrison and RAF Catterick. The famous No. 56 Squadron RAF flew Spitfires from Scorton during the Second World War. Also the USAAF 422d and 425th Night Fighter Squadrons were stationed at Scorton flying the Northrup P-61 "Black Widow" fighter. The USAAF Ninth Air Force transferred two P-61 Black Widow night interceptor squadrons to Scorton from RAF Charmy Down near Bath in Somerset to train and fly with the RAF night fighter Operational Training Unit assigned there. Initially flying de Havilland Mosquitoes, their first P-61 arrived at Scorton in May 1944 and their first assignment was to chase night-flying V-1 "buzz bombs". ^ a b Halpenny 1982, p. 167. ^ Halpenny 1982, pp. 166–168. ^ a b Delve 2006, p. 229. ^ Historic England. "RAF Scorton (1409216)". PastScape. Retrieved 1 June 2016. Wikimedia Commons has media related to RAF Scorton. This page was last edited on 13 February 2018, at 03:00 (UTC).